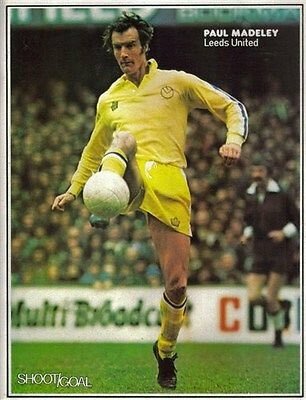 Was a good player and great servant for Leeds when they were one of the best teams in the land. I can remember ever player from that 1970 cup final, mainly because my brother - at the time - supported Chelsea - a terrible crime for which he has now repented - so I naturally had to support their opponents. Was gutted when Chelsea beat them in the replay, David Webb getting the winner in extra time. RIP. Great team under Don Revie and at times played the way Barca do now but a lot more x rated. They weren't called 'dirty Leeds' for no reason. On another note what has happened to this once very popular forum? Find myself hardly ever bothering to log in due to the lack of traffic and because a lot of the characters like Facto, Lone and Jfish seem to have disappeared? Too much political correctness/moderation? It seems to have gone under the radar since the site got revamped. I was considering putting a vote up on the main page to get "off topic" subjects allowed back in the main forum, same as it is on other sites like LFW. Personally I like everytihng thrown together, I think it makes the whole site more interesting. It works well on LFW and I think they get more traffic because of it. Madely always seemed to be the first name on Revie's teamsheet whether Leeds or England.Not the most skillful of players but so solid and a vital piece in the jigsaw. That Leeds team of the seventies....unbeliveable,and even the flair players could put it about.First time they came to LR we couldn't get the ball off them for about twenty minutes! Was this the Leeds team Allan Clark, Joe Jordan and Eddie Gray played for? They were often on telly in Norway. I was a Leeds supporter until 1971 (just after turning 14) when I started getting into QPR and don't have a lot of time for Leeds these days. Madeley was one of the greats. Met his old teammate Norman Hunter in a restaurant in Otley, West Yorks Feb 2017. Introduced by my uncle, who knew him. It was probably the Leeds-Chelsea rivalry of the late 1960s early 1970s that left me with a lifelong hatred of all things Chelsea. Give me Leeds over them any day, even now. During his career he played in 10 different positions for Leeds.